CDante: Hey, sure! I’m an ‘80s kid from Europe, playing video games since the age of 4, so things I feel nostalgic for often date three decades back. When some of my friends tell me World of Warcraft was their childhood I feel very old, but I like to think I’m not THAT old yet. I was born and have lived most of my life in the beautiful city of Budapest. I work as an IT programmer and started modding shortly after the release of Fallout 4, almost three years ago now. It has become my number one hobby ever since and been consuming my free time almost exclusively. As if it was planned: on December 31st of this year, it will be your 10-year anniversary on Nexus Mods! Do you recall how it all got started for you, what made you want to join, and what made you want to make and release your own mods? I remember why I registered because I clearly remember Fallout 3’s impact on my life 10 years ago. (It was almost as intense as Fallout 4 was in 2015.) I heard about Morrowind and Oblivion - sure - but when it came to RPGs I always preferred isometric games like Baldur’s Gate, Icewind Dale, and of course, I absolutely loved the classic Fallout games from the late ‘90s. I always loved post-apocalyptic themes in books and movies so the franchise just hit the perfect notes for me. Needless to say, when Fallout 3 came out in 2008 I HAD TO try it. And that’s how it became my first 3D RPG and the first Bethesda game I’ve ever played. And man, I got hooked… I remember I couldn’t stop playing it for months, literally day and night. 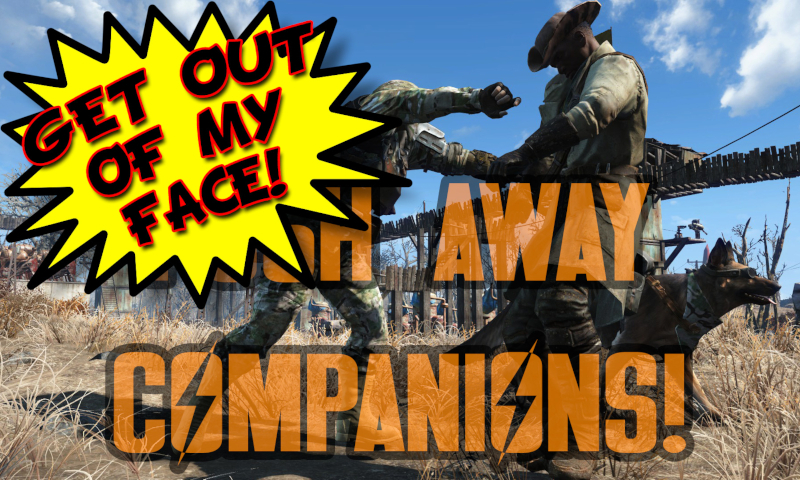 I tried to max out everything, and absolutely loved the companion system – I wanted to have them all at the same time! That’s how I got introduced to the in-game console, and that’s why I started to download mods for a game for the first time. But I wasn’t really active on the site for many years, later I returned for Skyrim mods, then, of course, I had to download some cool mods when XCOM got a reboot – one of my other beloved franchises from the last century – but overall I’ve been really just lurking here up until my first mod release in early 2016. Some of your most popular mod creations are Visible Companion Affinity and, of course, Transfer Settlements. What was the inspiration for those two in particular? Like in Fallout 3, the permanent companions in all Bethesda titles are a big part in my game experience and why I love playing these games. In Fallout 4 they definitely delivered on that part, especially with the new affinity system they introduced. I wanted to see how I progress with them, how my actions affect the numbers behind the scenes so I could max out my relationship with each of them. So I started to look into Papyrus scripting, and Visible Companion Affinity was born. Later on, I released more and more script-based mods, and by the end of 2016 Transfer Settlements was just something I knew I could do and would be a tool that would greatly benefit the community. So I uploaded a first proof of concept video in early 2017. The reception was amazing, it really felt great reading comments from Gopher, Oxhorn, JuiceHead and many others, so in the next three months, I was working really hard to make it a reality. I received a lot of help from Expired6978 and registrator2000 as I was completely new to F4SE plugins at the time. From all the mods you have created (including contributions to other mods) do you have a favourite or one that you are most proud of? I always felt Transfer Settlements is my magnum opus and probably the most important of all my mods. But apart from that, I’m really proud of The Wasteland Codex as well. It’s amazing to work with such a quality content that the folks at the ShoddyCast and The Vault wiki provide, and so satisfying to put the perfect voice for the perfect Fallout chronicler into the game, courtesy of Mr. Jason Damron. Oh, and of course GTKYMA Radio featuring interview #7 BigBizkit! Jokes aside, at the time it was a huge deal for me to work together with Darren on a mod, and putting the same interview series into the game that actually inspired me to become a modder just a few months earlier. You also have a little bit of a reputation for creating tongue-in-cheek mods and having fun with your creations in general. Uncle Pete’s Special﻿, or Helium Balloon are good examples of that. Where do you get the ideas for your more silly mods? Do you have a favourite humorous mod from another author? When it comes to memes I prefer humour rather than hate, and when it comes to seasonal mods I prefer April Fools over Halloween, Christmas or anything else. I don’t know. Humour was always a big part of my personality I guess, and these ideas usually just come up while following the latest buzz, and then I quickly implement them as mods within a few hours before they would get anything more serious or overly complicated. 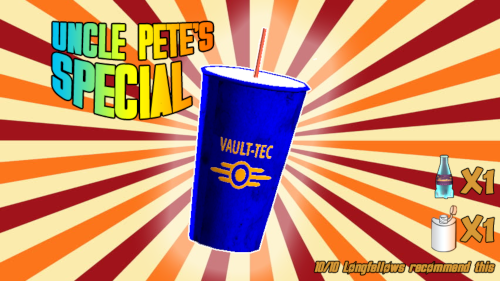 Uncle Pete’s Special was created while I was bored watching the 24 hour livestream of Fallout 76’s announcement. The idea of the Helium Balloon occurred to me when somehow I ended up browsing through my GOG library, and started playing a few hours with my old favorite point & click game, Monkey Island 3. I created Press X to Shaun when I came across a YouTube video of that old Heavy Rain “Shaun glitch” and realized that it’s perfect for Fallout 4 since that’s the name of the Sole Survivor’s kid as well. And I guess The Creation Club was me overreacting to a pun just a bit. 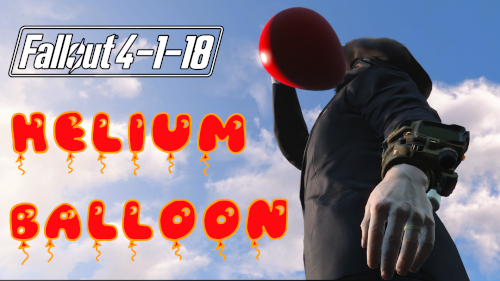 Being a mod author who is mostly focused on the Fallout series, you have been the first author to release a mod for Fallout 76. Where do you think modding for the Fallout franchise is headed in general? What would you want to see for future titles in terms of modding? I created that very simple main menu loop for 76 as a proof of concept and with the sole purpose of giving the modding community a small nudge. It was good to see the number of 76 mods growing over the next weeks, and today I couldn’t even play the game without reg2k’s Better Inventory. When it comes to 76 in general, I’m probably more optimistic than most. I hope, after the many controversies, Bethesda will find their way back to their fans eventually by ironing out the numerous issues the game still has and starting to provide a service and new content that worth the full price of the game for any Fallout fan. And in the meantime – while our hands are obviously tied for a long time – probably for more than a year still – I’m pretty sure us modders will do our part and will find more and more creative ways to make this game better with the tools we currently have. I recently spent three days dissecting the vendor/container menu, trying out numerous ways to show up an additional bit of info on the UI whether plans or recipes are already learned by the player. While I certainly failed to come up with a working solution, I’m pretty sure there’s someone out there in the community who will think outside the box and release an instant "Mod of the Month" with a different approach. However, my excitement for the upcoming 76 private servers is moderate at this point. Sure I plan to have my own server and I’m definitely going to try out new things on the server-side of modding that we cannot touch today. But who knows if that’s going to be in late 2019 or the second quarter of 2020, and how many players will opt to switch to a private server then? Will they do that even if they have to start a new character for it? How many users would download mods if those mods could only be installed by server owners through Bethesda.net? These are the questions I’ve been thinking of recently, so I’m a bit sceptical and trying to keep my excitement at bay for the time being. Eventually, I can imagine 76 as a hub where players meet occasionally to play together, a sandbox where all of us have our maxed-out lvl 200+ characters with the perfect C.A.M.P. builds, everything unlocked, every quest completed, and we will return to this playground over and over when Bethesda releases some new content. And in the meantime, we play the more meaningful first-person adventures of earlier titles like we always did, and that’s fine with me, to be honest. One thing is for sure, I still have twenty times more WIP projects and mod ideas for Fallout 4 than for 76 that I definitely want to finish at some point. Do you have any plans for the near future when it comes to mod releases? I’m slowly working on a quest that’s both going to be a standalone mod and part of The Wasteland Codex. I don’t think it’s a huge spoiler if I say it’s going to feature ED-NA and The Storyteller, and since I started to play Fallout 4 again, I also want to finish some smaller quality-of-life mods that I started working on earlier this year – one that lets you whistle Dogmeat to issue him commands, for example, to find the corpses of your recently killed enemies; another one that lets you command your companions to automatically fix their own Power Armor; and I’ve been also working on a winter mod that makes your breath visible. Of course these are smaller projects, the big one is always Transfer Settlements, and currently, my biggest mountain to climb is to be able to export settlements directly as ESP or ESL plugins. Before modding, miniature tabletop games have been a huge part of my life for decades, especially Warhammer 40k. I have even organised a yearly convention for the hobby here in Budapest for nine consecutive years. I play airsoft occasionally, that’s another hobby that has been part of my life for a decade now. I also play the bass. What are some of the games you grew up with and are you playing any games currently? Do you use any mods? Apart from those I already mentioned. I’m a huge fan of point & click adventure games. LucasArts is MY childhood, and I love to see the genre living its renaissance lately. I can always find new point & click games on GOG or Steam that look retro, but came out in recent years. They give me nostalgia even though I’ve never played them before. I also have a huge backlog of open-world titles – I’ve yet to play the DLCs of The Witcher 3 and definitely want to try out Kingdom Come: Deliverance, both of which I plan to mod for sure. Onto a completely different topic: how did you spend Christmas? Traditionally I visit grandparents in Budapest on the 23rd, then I spend Christmas out of town at my father’s. He is an amazing chef so it’s always a great time to be hungry when I’m there. Do you have any New Year’s resolutions - modding related or otherwise? First of all, have to return to the gym after all this food as soon as possible. I have also decided to release smaller updates for my older mods to fix some minor issues that have been present for ages. It would be awesome to start the New Year with cleaner bug report sections. I would also like to upload videos to my YouTube channel more often. I have a ton of tutorials planned and it would be nice to finish all my WIP modding projects in 2019. There’s one in particular that I started back in 2016 and it hurts me to even think about it that it was more than two years ago and never got finished – talking about the real-time hair and beard growing for Fallout 4. Is there anything else you would like to say to the Nexus Mods community? Support ElminsterAU and the xEdit Team on Patreon! For many mod makers, the editor they created is just as important to modding as the Creation Kit, if not more. A big thank you to CDante for answering our questions. As always, if there's an author or mod project you'd like to know more about, send your suggestions to BigBizkit or Pickysaurus. And once again the Nexus is doing its job by spotlighting and supporting mod authors. Well done and thank you CDante for your hard work and mods for the community. Hey CDante, great interview. I love your work. Your an author I look up to! Thanks for the shoutout to the xEdit team as well. Thanks for the interview Dante! Happy New Year to you and your family! In fairness, a lot of the features Bethesda puts in their games are inspired by modders, from this to the settlement system itself. If anything it says how good an idea Dante had. JMO but I'm a little biased because he's helped me with a lot of projects. Love your content! thank for all your work! Congratulations sir. Not only are you a prolific author in our community, you're also one of the good guys. Love your mods and so nice to learn more about the person behind the mods, thank you for all your hard work!! Congrats Dante! I am very lucky to call you friend. BTW, you're too modest, and I am a horrible proofreader.